Pay your tuition in two payments and receive a 5% discount on total tuition. The first payment is due at the time of registration, second payment is due by December 15th. Pay your tuition in monthly payments. The first months payment and registration fee are due at the time of registration. Subsequent monthly payments are due the 1st day of the month. A $10 late fee will be applied to your account if payment is not made by the 7th day of the month. 1) multiply your monthly tuition amount by the number of months you are pre-paying for. 2) calculate and subtract % deduction. need assistance calculating your total. Tuition is a seasonal total ($585) broken down into monthly payments for your convenience. Once you register your child you are responsible for paying every month in order to have your child participate in the dance recital; you cannot take off a month and skip a payment. If you register in the middle of a month the fee will be pro-rated. refunds for absences or missed classes. Payments are due the 1st of the month, if we have not received your payment by the 7th of the month a $10 late fee will be applied to your account. The late fee policy is strictly enforced. The 1st month's tuition and the registration fee are due at the time of registration. 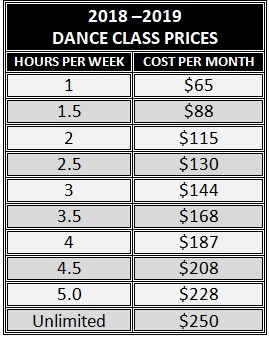 The registration fee is $25/dancer 40/family, which covers administration costs, insurance, and music licensing. ﻿﻿Payments may be made by cash, check, credit or debit. Dance Academy parents may enroll in auto pay using your credit/debit card and you will never have to worry about late fees! Charges will appear on your bank statement or credit card statement as being from Ave Maria Dance Academy.